Folding Chairs 4 Less employs other companies and individuals to perform functions, such as fulfilling orders, delivering packages, sending postal mail and e-mail, serving ads on our behalf, providing search results and links, and processing credit card payments. These third-party service providers have access to Personal Information needed to perform their functions but may not use it for any other purpose. 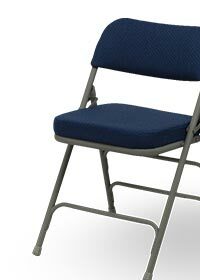 California law permits individuals who provide Folding Chairs 4 Less with Personal Information and who are California residents to request certain information regarding our disclosure of Personal Information to third parties for their direct marketing purposes. To request this information, please contact us. When you send or otherwise transmit your sensitive information (such as your credit card number) to or though FoldingChairs4Less.com, your sensitive information is encrypted and protected with SSL, the current industry-standard encryption protocol. When you are on an SSL-protected page, a picture of a closed lock appears at the bottom or top of some web browsers. Another way to tell if you are on a secure page is to check the URL or address of the page. (Look in the address box or right-click on the page and select "Properties".) These secure SSL-encrypted pages have URLs that start with "https://" instead of "http://".